You will scan the barcode on the reservation upon entrance and exit. PHX Sundance Airport Parking, you will find some of the most convenient parking at the most competitive rates. For an airport as busy as Phoenix’s Sky Harbor, having amazing long-term parking facilities is important and we offer all that to our customers and then some. 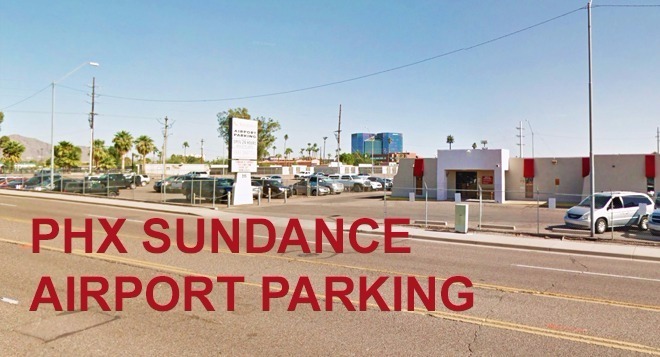 PHX Sundance Airport Parking is a secure, fenced facility with 24/7 security camera surveillance. They have convenient 24/7 on-demand shuttle service provided by Sky Harbor Airport Parking. Only 4 minutes from the airport with an experienced and courteous staff, Sundance is the best option for Phoenix travelers looking to save on airport parking. If the lot is full when you arrive, you'll be directed to park at Sky Harbor Airport Parking half a mile away, at no extra cost, Sundance is owned by Sky Harbor Airport Parking. You MUST print your confirmation and present it upon arrival. You will scan the barcode on the reservation upon entrance and exit. The great thing about this lot is that booking ahead of time saves you money. Reserving your spot online beforehand will give you a daily rate price of $5.00 while driving up and claiming a spot at the last minute will give you access to the still low price of $6.50 per day. Not only do you get great pricing, but this lot is accessible 24 hours a day, 7 days a week. This gives everyone access regardless of when their flight arrives or departs. No matter the time of day, you will be able to leave your car and have it parked for you so you have one less thing to worry about. 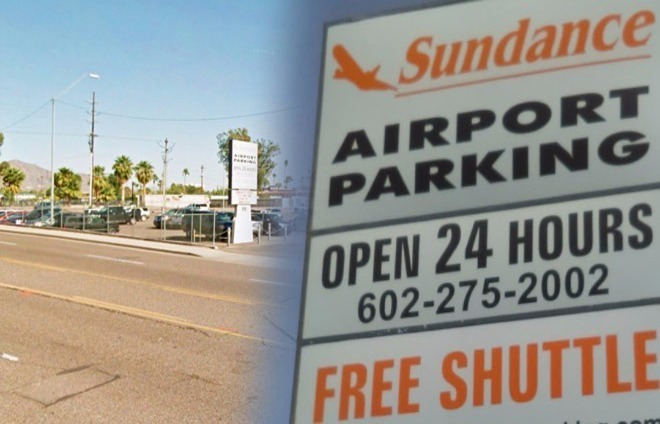 In addition to all this, Sundance / Sky Harbor provides a complimentary shuttle service to all PHX Parking customers so they can make it over to the airport in minutes and not have to worry about being late for their flight. The attendants are more than happy to help you with your luggage on to and off the shuttle bus. Our long-term PHX parking facility is also extremely secure, well-lit, fenced in and equipped with security cameras. When you leave your car in our lot, you can rest assured that it won't be tampered with in any way! Reserve your spot now for the cheapest PHX Airport Parking rates! Upon arrival you will scan the barcode on the reservation upon entrance and exit. TERMINAL 3: Exit on the North Side of ground level, out Door #9 to center median. TERMINAL 4: Exit on the North Side of ground level, out Door #7, and proceed to the Courtesy Area of the center median. If you do not see the Please call 1-602-275-2002 for a pickup. Let the operator know that you are going to the Sundance Lot. Then look for the "Sky Harbor Airport Shuttle" – Green and White Vans. Advise the driver you are parked at Sundance. When you get back to your car proceed to the exit and scan your barcode to exit. Head on the 101 south to Loop 202. Use Loop 202 west to get to the Center Point Pkwy/Priest exit. Make a right (north) on Priest to Washington. Make a left (west) on Washington. Make a right (North) on 40th Street. Your final destination will be on the right. Use I-10 east to get to State Highway 143 (Hohokam Freeway). Take 143 to all the way Washington exit. Head west on Washington to 40th Street. Make a left (North) on 40th Street. Use Highway 51 (Piestawa Peak Expressway) south to I-10 & Washington-Jefferson exit. Use I-17 south to get to I-10. Make a left at light at bottom of ramp all the way to 40th Street. Take I-10 east to Washington-Jefferson exit. Take Jefferson east and continue when it changes to 40th Street. Very impressed with shuttle service! Quick service and courteous drivers. Only thing that may have created an issue was our printed barcode would not scan when we wanted to exit. Fortunately we were there in time that there was someone inside that was able to assist. Question - When I booked, I was charged $5.15 as I expected but when I was issued the receipt from the attendant when we left the parking lot it said parking total was $4.12. Please explain. Thank you. Worked out well. The only thing that was the initial lot we were sent to was completely full and we were sent down the street to another lot. I’m glad we weren’t running late. Easy and convenient! Nice staff. Although the parking lot is smaller at Sundance the drivers are super friendly, I watched the driver carry luggage to a lady's car and make sure that her car would start before he drove away because her car was parked there for longer than a week. Which I thought was cool. To enter the guy had to scan my paper and I waited while he did something, then after 5 minutes or so, gave me back my form like there was never a problem. Meanwhile cars were waiting behind me. This would be a great system if you just scan in and scan out. I thought that's what this was supposed to be. Also - I just made a reservation again - had a problem with an email address, click "Chat"... then nothing. The Chat seems worthless. The problem was as simple as checking the box indicating "guest". Get rid of the chat - you're wasting $... or maybe you're not - I saw no evidence of anyone or anything on the other end of Chat. In general, I'm happy with the service you provide - nice shuttle drivers - quick service - safe place to park. I am very impressed with this service. They are one of the best that I've ever tried. I saved so much by booking with them instead of trying to park at the airport itself. I will be using this for all my future trips. Very affordable and impressive. I expected them to be a lot cheaper when it comes to security and things like that but they were as good as any of the other places that I've used and a fraction of the price. I swear it took less than 5 minutes to make a reservation. I was worried that the code wouldn't work but everything went very smoothly and I have no complaints. The location is amazing especially since it's so affordable. It's very easy to get to no matter where you're coming from. Parking expereince was good. The shuttle ride was only 5 minutes which is the shortest that I've ever been on. I have used this place a few times now and will continue to use it. The price is one reason but honestly I appreciate how helpful they are and the customer service reps who have always helped us out. It's also a very secure lot which I appreciate. Overall, I would use this again. Staff was always very friendly and the attendant spent almost 10 minutes talking to us about the facility and answering our questions. I appreciated them taking the time and helping us out. Shows that they really care about customer satisfaction. If I could I would be giving this 10 stars but this only goes up to 5. I got the best service that I've ever had. They called the shuttle and told us how long a wait it would be and were told to park in this spot and it would be there very soon. We parked, grabbed our bags and the shuttle was already there. Amazing! We scanned our code and got in after 2 am and there was no one there except the security guard walking around. The lot felt very safe. We called the shuttle ourselves and they said it would take 10 minutes but they got there in 5 which was great. Very affordable which is necessary when you are planning a family vacation. You have to stick to a budget and I appreciated this price which helped me keep to it. Also I liked how there was a security guard as well as cameras for added security. One of the best. It was the best price that I've ever seen before for airport parking. I'm used to paying double for the same amount of time! I didn't have any problems with getting in but when I got out it was 1 am and I had to call the shuttle. I called the office and meanwhile there were other people waiting as well. They said that they were sending one over and I told them to send two since there were a lot of people. Waited another 10 minutes for the first one to arrive and then another 5 for the second one. Wish it was a little faster next time. The reservation was for a week and I got a good deal on it when I booked online. The only thing the shuttle took a bit longer than I wanted. Driver explained that it was traffic so you should be aware of that. It's open all the time. I was worried that I wouldn't be able to get to my car since I was getting back at 4 am but it was very easy to get the shuttle and then scan my ticket myself. It's in my top 3 best parking services for the price as well as the convenience of being so close to the airport. This parking lot is quite big which made me nervous since I thought that the security wouldn't be very good. But it was all fenced in and they also had guards around and I'm told that they have more at night. The video cameras are added security and that made me feel better. We honestly had no problems or complaints about Sundance Airport Parking. I preprogrammed the numbers for the office and shuttle in my phone just in case. They didn't tell us that we had to call the shuttle when we got there which made me feel like other people might not have known. I think that they should tell people everything that they say on the website so that there are no problems. Still very good and we had an excellent expereince with them. For $4 a day I would choose this place over all the rest even if it didn't have all the other benefits that it does like good security and a free shuttle. Some lots that I've used have been in bad shape and very hard to drive around but this one is very well taken care of. They have people to help you with your questions and your bags as well. The shuttle service is very fast and I was at the airport within 20 minutes. I tend to use places like this when I travel. It's just a lot more convenient and works better for me since I don't have to worry about being on anyone else's schedule. This is by far one of the best that I've used. The security is great and it's very affordable as well. I used this service for my last 2 trips. The first time I was a little confused but they were very helpful. The second time, my shuttle driver was amazing. They helped me with all my bags and even came to pick me up from the gate I was at instead of making me walk to another one. So impressed with this place. I thought that this place was excellent. I really liked that it was cashless and also that I could pre-book online so I didn't have to worry about showing up early to make sure I got a spot. That's always the fear with these affordable places which is that they'll fill up before you get there. I saved a lot of time and money when I used Sundance Airport Parking. They were one of the easiest places to get in and out of even when there wasn't any in the booth. It's very close to the airport which is a good thing especially at the end of the trip. The shuttle is very fast. There's barely any waiting and it's also very clean. I've never used one of these places and I didn't realize that I had to print anything out. The person told me that I could also use my phone but it took 3 times before it could scan. I was worried that they would charge me each time but they said that it doesn't work like that. I did like how secure the lot was though. With the price there was no competition. I wasn't going to pay almost double for a place that was even further away and didn't have as many benefits either. The attendant scanned our barcode for us since it wouldn't work when we did it. Exiting we had no problems at all and the code scanned fine. We had to call the shuttle ourselves and they came to pick us up from our car and driver was very nice. The shuttle driver was very good. Top notch guy. He wanted to help me with my suitcase even when I told him that I could do it. He was friendly and made the ride go very fast and made it a lot more fun too. They have really great service and staff that really care. I had absolutely no problems. I expect technology to be a bit finicky but I had no trouble with scanning in and out. The drive to the airport was very fast and easy with no issues at all. Even when I was coming back, I didn't mind having to wait for the shuttle and the waiting area was very close to where I was exiting. I was able to grab a coffee and enjoy it while I waited. I am a fan of using airport parking and I don't really mind paying for the convenience. PHX Sundance Airport Parking helped me a lot. They directed me to one and even let the shuttle driver know that I was there and waiting. He was only a few spots down so I just over to meet him. I was pretty happy with PHX Sundance and will be using them again. I was very amazed when I first entered the lot. The gate opened up as soon as I scanned my reservation and I was able to find a spot off the side. However, there was a small issue when I was leaving. The gate wouldn't open for me. I was very frustrated and called them and they sent one of their attendants over. I thought that their response time was very fast and I was able to leave when it was fixed. I couldn't find the confirmation email I printed so I called customer service and they said that I could still use it on my phone. The code worked when I was getting in but when I got home I realized that they had charged me for an extra day. I called them again and they apologized and said that I would get a refund soon. I didn't know why they didn't just tell me that when I left. There isn't enough space or a high enough rating to say what I want about PHX Sundance. This lot is one of the most secure places that I've ever used before. I think the fence really helps and the security guy who waved at me when I came in. I came back and my car was still there and I could just go home right away. It was perfect. I'm very protective of my car and where I leave it. I usually tend to pay more and go for more expensive places because they have better security but this one is very comparable and the price can't be beat. I had a small problem. Not with the service but my flight was delayed which would have put another day on my reservation. I called them when I was on my trip since I figured that would be faster. They told me that the only thing that they could do was offer me a discount for the price for the extra day. It only ended up being an extra $2 for the day. I was impressed with their customer service even when I wasn't in the same country! It's one reason that I would book this place again. I got a deal since I booked online. The lot itself was clean even though it was outside and it's completed surrounded by a chain link fence. They took their security seriously and they also had a security guard and video cameras for added protection. I booked my reservation online and it ended up being a lot cheaper than I thought. I didn't realize that I would get such a good deal. The actual experience of parking was very easy and the shuttle made it very convenient. Booked my place and showed up on the date of my departure to park my car but the code wouldn't work. I tried it four times and the gate just wouldn't open at all. I had to call the office and it took another 15 min before someone came over and opened the gate for me. I was worried that I would the same problem when I left but they fixed it and I wasn't charged extra. It really is one of the best and affordable parking lots that I've used. The lot is surrounded by a fence which adds some protection and the video cameras and guard helps too. Didn't realize that I would've saved money if I booked online. I just showed up and paid at the end. They let me know as I was leaving that online bookings got better deals. Appreciate them telling me that and I will be sure to do it next time. Entering and exiting is very easy. That's the one thing that I appreciated. It was a very simple way to do it. Some places that I've been to are very complicated and there's so many ways to do it but this one was straight forward. Very reasonable. I paid less than $50 to stay here for a week and I didn't have to worry about getting a ride to and from the airport either. I've used more expensive lots that were farther away from the airport and didn't have as good security as this one did. I also liked how they actual had someone at the gate that you could ask questions directly. We called ahead to let them know we were on our way and asked how long the shuttle was. They assured us that their shuttles were between 5-10 minutes which was amazing. Getting in took no time at all. Even with travel time it was still the shortest amount of time that it took me to get to the airport. I will be using this one again. I thought that the price is very reasonable and a lot cheaper than other places that I've tried before. The lot was quite large. The only thing is that we were directed to the other parking lot since it was full but I noticed a few spaces that we could have parked in there. Not sure what that was about but still pretty happy with the experience. The customer service is very nice. My flight was delayed and I had to change my reservation. I called and the person explained how to do it and then said that if there was an issue I should call them directly and they would deal with it but I didn't have any problems. This place saved me a lot of stress and a lot of money when I went to visit my parents. I paid a lot less than I usually would at other places and it was a lot easier to use as well. For the most part, this place was great. It's obviously very affordable and the security is pretty good. We called the shuttle and the line was busy, waited a few minutes and someone picked up. Overall, it was very fast and the ride was comfortable. We very happy with the experience of using PHX Sundance Airport Parking. I like the ease and convenience of paying before hand with a credit card which meant that we just had to scan our ticket when we got back to leave. It was very easy. Booking a spot is a breeze. I swear it took 5 minutes to get a spot and then actually parking probably took the same amount of time. It wasn't that busy when we went so we were able to get in and out very quickly. Overall I was very happy with my experience. The attendant at the gate was very nice and directed us to where we needed to go. The shuttle was very fast. It showed up 10 minutes after we called it. The quick trip to the airport was also very much appreciated. Very good security. It's entirely fenced in and you need to have a code to get in and out which made me feel better about leaving my car there. As well as this though they also have video surveillance and security guards. I didn't worry at all about my car while I was gone and when I got back there were no scratches or bumps or anything on it. I really like PHX Sundance Airport Parking. It's open all the time so you can have your car parked any time of the day or night which is very convenient. I didn't read the site well and waited for the shuttle, not realizing that I had to call it first. It was my fault but they should have made it clearer. Very secure lot. They use two kinds of security which is great for the affordable price. Usually the more affordable places will skimp on certain things but this one doesn't. A lot better than some of the more expensive places I used. Everything was very fast and convenient and the staff were very efficient. Booked it for 1 am but I think I read the date wrong and I thought it was the day after. Had to call and explain the mistake. They seemed like they got it but I still had to pay for the extra day. At least I was able to get the best seat on the shuttle. Some of the best security. They noticed that I dropped my wallet and actually called the office who called the shuttle that I was on so that we could turn around to get it. They dropped off my wife and kids at the airport and the rest of the passengers and then drove me back to pick it up. One of the best parking lots ever. It's very spacious and there's a lot of spots and they also have a second parking lot available if the first one gets filled up. The staff were very good at directing us where to go and what to do. I have never used airport parking before. Usually I get someone to drop me off or take a cab. I thought it would be a hassle but it was so easy and I can't believe that I never tried it. I booked online and then just showed up. I didn't have to worry about paying at the end since everything was done in advance. Plus it was a lot less expensive than getting a cab to the airport. I paid less for a whole than I did for one cab trip to the airport. The staff were amazing. They knew exactly what they were doing which made everything go more smoothly so I was only there for around half an hour and was very early for my flight as well. Very good price and staff. Shuttle service is on demand only which means that they aren't just waiting around so it might take a bit more time. I programmed the number in my phone and called while we were waiting in line which worked out alright for us. Really enjoyed this place. There were a lot of benefits especially with online booking and also the security. There's not much that you can say about a shuttle. This one was very clean, no dirt on the floor, the ride was short, took about 7 minutes to the airport which is why I chose to park here. I don't usually use long term parking since I don't go on overnight trips that much. That being said, I can see why people do if you get such great service for such a great price. The lot I booked was full, sent to another, took another 10 15 min to get parked, not too bad. Shuttle picked us up right away both times, even at 2am. Very cheap. I paid $4 for one day which is the best price I've ever paid for parking. This is my new favorite parking lot. I really liked the price and also that they had an airport shuttle. It meant that I didn't have to worry about arranging a ride when I got back from my trip. It was very easy to arrange a place and time to meet the shuttle. I got there at 7 am and the attendant was very friendly even though it was early in the morning. She told us that the shuttle would meet us at our lot and to call it. My girlfriend called as soon as we left the gate and the shuttle didn't take long. The driver was very good. He helped us with our bags and said that we could get going soon. I appreciated him letting us know that instead of just waiting around. Everything is electronic. They do have people there during the day and most of the night but they just scan for you instead of you doing it yourself. I brought my credit card just in case I got charged but there was no need since I kept my reservation. The price changes depending on the day and how you book but it never goes up by much. They also have 24/7 access to the shuttle and 24/7 security that includes video cameras and guards. I booked it for the price but I was very impressed by the overall experience. Booking online saves you time and money and I think that it's worth it. $4 was one of the best prices that I'd ever seen for parking. Great customer service, easy drop off and pickup. We showed up at 2 am and there was no one in the booth so we just scanned our code ourselves and got in. We didn't know where the shuttle was so we called the office line and they told us how to get it. It was very easy and they were very helpful. They offer a lot of deals which makes it even cheaper than the already very affordable price. I really liked that part of it since travelling is expensive enough without adding on parking fees. It's very close to the airport which is why I picked it. The price also helped a lot since I don't like paying more than $50 for airport parking. Usually the cheaper places are the ones that are pretty far away but this one was very close. I really like how I don't have to worry about carrying cash with me or bringing my card unless I go over my reservation. I entered earlier than I was supposed to but it didn't make much of a difference since the day rates are so cheap. The hours are the reason why I chose this place. I like early morning flights and I liked how easy it was to get in and out. There's no there after a certain time but you can still get in and out as long as you have your reservation code and scan it. It's very easy to make a reservation. Which is something that I appreciate since I like things to be very easy when I travel. Also I appreciate the shuttle since I wasn't looking forward to having to get a cab to the airport. Made reservation in advance and paid online.Was not informed in advance that lot was full.Caused a lit of hassle morning of flight to be put in another with another bar code and no directions to that lot.Also no shuttle info.Felt like I was not treated well at all. It's $4 a day. That is very reasonable and one of the best and most reasonable prices for parking. I paid less than $100 for a week of parking. That's unheard insane. I thought that the facility was very safe and secure. They had video cameras around the lot so they could watch the cars and even see who was coming in and out. They also have a security guard who checks up on things. I was very impressed by this. You can book online or you can go there and see if they have spots available. I did that the first time but I booked online for my last trip and liked it a lot better. It makes it easier to make sure that you get a spot, plus you can pay for everything right there and there's even a bit of deal. I booked online and it was a lot cheaper, around $4-$5 rather which is a great deal. The actual experience of using them was just as effortless. I only had to show them the reservation and the gate opened to let me in. Then I scanned that same sheet when I got back and voila. When we went the lot was full so they brought me over to another parking lot which was a few minutes away which wasn't bad. It was still the same price so I liked that a lot. I didn't expect a lot for the price since it is $4 a day. You get a good expereince with a really nice parking lot, 4 minutes from the airport and the shuttle is very comfortable and well maintained. This is the only parking that I will using for my trips from now on. Lot needs to be resurfaced and have lines clearly marked. small lot easy to find your vehicle. The exit could be marked better. Although Sundance was full, they had a sign that directed us to the next available lot, and Sky Harbor Parking honored the Sundance receipt as promised. It was quick and easy. No issues, can not beat the price. Yes, it was a place to park. The shuttle was great. The parking lot is in bad shape and even hard to roll a suitcase. There are no lines and everyone parks wherever. I had to pull out my vehicle to get my luggage in. I had problems with scanning on the way in and way out. Thankfully leaving there was someone there to help. Had a good expererience. Will sure use it again. Pleased. Only problem was that the bar code would not scan on going out, but did scan when going in. Per the guy there the bar code was too large when I printed the receipt with the bar code on it. I think the machine for bar code needs to be repaired or upgraded, as I can scan going in but not when coming out. Otherwise satisfy with the first encounter. Easy prepay online, great price, fast pickup at the lot and nice, courteous drivers who helped with bags! We will be back for sure ;). Everything went smoothly. Exactly the way it was planned out. I would use it again definitely. Lot was full when I arrived, they sent me to another lot which almost cost me my flight. Would have been better if I knew this at time of reservation (which was made only 20 min before arrival). Worked well when I left. When I got back my bar code was not working. Woman at the window was very rude, could not find my records and finally let me out after about 10 minutes, again being rude and unprofessional even after me giving her all my paperwork. But, I would park here again, so convenient and stress free. First time and impressed would definitely use it again. Very professional and fairly priced.